Dating the year before the Franco-Prussian war, the print references Greek mythology. 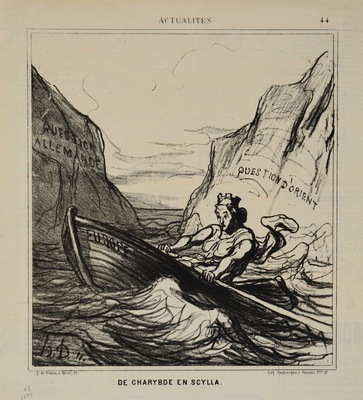 A rowboat (Europe) tries to navigate between the hazardous shores of Scylla and Charybdis. Marianne (symbol of France) handles the oars. Inscribed on Scylla’s cliffs is the “question of Germany” and on Charybdis’ cliffs the “question of the Orient” (referring to the Ottoman Empire). Daumier’s use of visual metaphors alludes to real dangers that France faced during the last years of the Second Empire. Indeed, Germany and France began a war the next year, which France lost.